Philadelphia Police have arrested a man wanted for stealing laptops from a car belonging to campaign staffers for Hillary Clinton. The theft happened around 8 p.m. Friday along the 100 block of Brown Street in Northern Liberties. The computers were left in backpacks in their SUV when the the workers went to dinner nearby. When they returned about an hour later, they found their car had been broken into and their computers stolen. The initial concern was that those computers may have contained sensitive campaign information. Philadelphia Police treated the theft as a routine smash and grab, though they had the help of the the Secret Service and the Department of Homeland Security. A warrant was executed on the 500 block of Diamond Street on Saturday evening. A 27-year-old man who is known to police was arrested after the computers was found in the residence. Police say they believe it was a random theft and the staff was not targeted specifically. 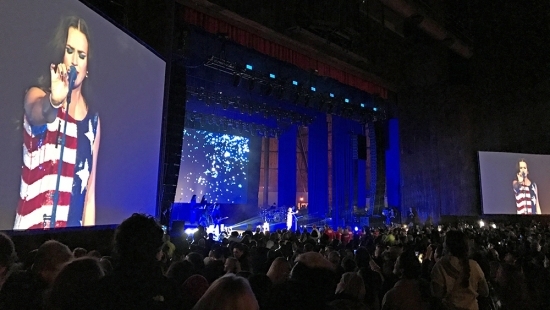 Pop star Katy Perry performed a free concert at The Mann Center for the Performing Arts on Saturday for a Get Out the Vote Rally in support of Democratic presidential nominee Hillary Clinton. Clinton, herself, spoke to the capacity crowd of 14,000. Senate candidate Katie McGinty, U.S. Senator Bob Casey, Congressman Robert Brady, Senator Cory Booker, former Secretary of State Madeleine Albright, and TV producer Shonda Rhimes also addressed the crowd. Clinton will be back in Philadelphia on Monday night to wrap up her presidential campaign. The rally will be held at Independence Hall at 7:30 p.m. She will be joined by President Barack Obama, First Lady Michelle Obama, President Bill Clinton and daughter Chelsea Clinton. Jon Bon Jovi and Bruce Springsteen will perform. The Philadelphia 76ers have decided on a date to welcome back the singer who was stopped from singing the National Anthem on Opening Night last month. Sevyn Streeter was scheduled to perform "The Star-Spangled Banner" on Oct. 26 at the home opener. Minutes before the performance she told she could not sing because of her “We Matter” t-shirt. Streeter will return to perform at the Dec. 16th home game vs. the Los Angeles Lakers. "After thoughtful conversation, the 76ers and Sevyn Streeter have worked together to develop a plan we hope will bring meaningful action to the Philadelphia community. Sevyn has accepted our offer to return to perform the national anthem on Friday, December 16th vs. the Los Angeles Lakers. She will also be joining the organization in our ongoing efforts in the community by partnering with the Boys and Girls Clubs of Philadelphia. Additionally, the Sixers will make a donation to the Boys and Girls Clubs of Philadelphia." "After a meaningful dialogue with the 76ers organization, I have accepted their apology. In order to move forward, it was important to me that we take action and use this as an opportunity to create positive change and dialogue throughout the community. The Sixers and I plan to work together through multiple community outreach programs to promote inclusion and acceptance. Our first initiative will be with the Boys and Girls Clubs of Philadelphia, to whom they are graciously making a donation. I am also looking forward to returning to Philadelphia in December to perform the national anthem wearing my 'We Matter' jersey at the 76ers game vs. the Los Angeles Lakers."